Jeffrey Wright. David Bowie. Dennis Hopper. Gary Oldman. Michael Wincott. Courtney Love. Claire Forlani. Parker Posey. Art House. Drama. Painting / Sculpture. 1980s. 01 Mel's Must Sees. Black Interest. Biopic. Recommended. 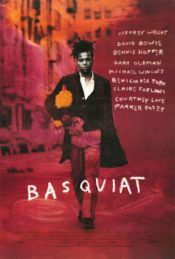 Low-key biopic of graffiti vandal turned New York darling Jean-Michel Basquiat. Catapulted to art-world super-stardom after a chance meeting with Andy Warhol, the obscene amounts of money his paintings suddenly command soon sends him down the slippery slope of big-time drug abuse. Enthralling.